What were you thinking as you started on Monster Hunter Tri? The timing was right for being bold and building from the ground up. 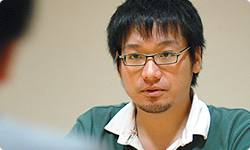 I’d worked with Fujioka on the home console series, but it seemed to us that somehow we had reached an end. So we decided to scrap everything we’d established so far, even the system, and build it again from the ground up. You didn’t want to just graft on an extension to the existing material? No. We wanted to be bold and pack in ideas from the ground level up. That’s how much we felt we had run up against certain limits. The challenge was how you would do it if you decided to start from zero and make something entirely new. But didn’t that make you uneasy? We were incredibly uneasy. Since we’d started making Monster Hunter, we had dealt with all kinds of people and formed a relationship with users, and many were saying that it could be much better. We ourselves had also frequently wondered while working on the series if we should have done something different. 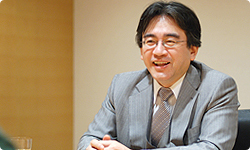 But it would have been difficult to do so if we keep the same framework as previous games. So in order to achieve what you’d always wanted to but had been unable to, the only thing to do was go back to the ground level and start over from zero. Would be fateful for the series? So we decided to rethink it from the ground up. It was really hard work, but we tackled it with a great deal of excitement. We enjoyed making each new thing one by one, and were amply rewarded for our hard work. And even as you reformulated the game’s contents from the ground level up, you chose Wii as the platform. The fact that Wii appeared while we were thinking about revitalising Monster Hunter from the ground up was the best possible timing. We were certain we could provide fresh excitement through game control and we were excited about the challenge, so we decided to make the world of the new Monster Hunter for Wii. It is, of course, a sequel, but we addressed it with a fresh spirit as if we were making a new game. But at first we were just getting a feel for things. We didn’t know much about the Wii hardware and had no idea how much was possible with it. With a machine you’re familiar with, you have a sense for what you need to do to achieve a certain effect, as well as for what can’t be done. That’s why we were so uneasy. But we felt like we were creating something new, so in some ways we were in a state of positive excitement. What did you think when you first tried out Wii? For example, I imagine the first thing you thought with regard to visuals was that you might not be able to do much. So it would be hard to surprise people only with graphics. I think good graphics are an incredibly attractive aspect of games. Even before people play a game, they are aware of its general appearance. That’s why everyone wants graphics with impact. So - setting aside high resolution and other details - when it came to creating impressive visuals, I thought it would be a challenge not to compromise. So I decided to press the boundaries of the console’s functions and urged the programmers and designers to aim for making new images. You mean making new images that would maintain the style of Monster Hunter. Right. Besides, I think the most important thing with regard to graphics is what kind of images the designer wants to make. No matter what kind of specs the hardware may have, if the designer has a clear idea of what kind of images he wants to make and concentrates hard on his work, I think he can achieve them. Well, having the raw skills to pull that off is one thing, but didn’t such work call for a lot of sense? Yes. While this isn’t only true for Wii, the world of Monster Hunter isn’t one into which you can just throw anything you want, so judgment was necessary in determining what to put in and what to leave out. The designers have a strong desire to turn out all kinds of stuff in order to create stunning visuals. Sometimes I had to say, “The visuals aren’t that important here. In this game they’re more important in this other area,” and get them to set something aside. On the other hand, the programmers had moments when they wanted to keep constraints in place, and I had to say, “No, we can’t hold back on that, but this over here could be restrained a little instead.” We had to find the right balance. And that was your job, Fujioka-san? You could make use of your strengths as a designer. Of course, building up each part wasn’t easy, but we were determined to make visuals based on the idea of coming and going seamlessly between land and sea, and we realised we could do it. That’s why I think it turned out well. Overcoming such obstacles gave the staff increased confidence. Um, I’ll be straight with you. I can tell Nintendo’s staff has really been galvanised by you. I can tell they feel like you did what they hadn’t yet. Besides, the enthusiasm you put into it is apparent in the graphics. I’m extremely pleased to hear you say that. 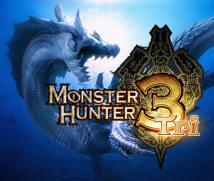 (laughs) Generating great visuals was one of our main goals in bringing out Monster Hunter Tri for Wii. Striking visuals were originally one selling point of Monster Hunter, so when we decided to bring Tri out for Wii, to be honest, many players may have been uneasy over just how much we could do visually. We thought that unless we got those types of people to think, “Oh, it’s totally all right,” we would have failed.